It's getting a little tough to add new birds to my Victoria List, nevermind a couple in a week, but I figured I would give it a try. Earlier this week I added Franklin's Gull, a long standing Victoria nemesis, at Esquimalt Lagoon. 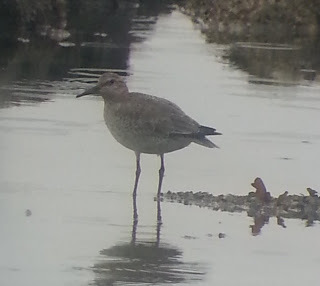 I figured I might as well take a shot today at an equally aggravating nemesis, Red Knot. A couple have been hanging around off of Oak Bay this week, and one has been seen fairly regularly at the foot of Bowker Ave. The weather wasn't particularly attractive this morning, which was just fine by me. Instead of prowling the beaches, many of the fairweather dogwalkers choose to stay home and leave the shorebirds alone. The light rain and fog didn't seem to have much of an impact on the birds either. Immediately after stepping down onto the sand at Bowker, I was greeted by Black Turnstones, Black Oystercatchers, Surfbirds, and Black-bellied Plovers. A little further down the beach I found more plovers, and then a Short-billed Dowitcher popped up. My hopes were getting a little higher at this point, and more birds were flying in, until a pair of kayakers pulled close to one of the rocks and sent most of the shorebirds flying back out to the island. Glancing back down the beach I noticed that, in true shorebird fashion, a second dowitcher had popped up, and a Greater Yellowlegs had joined the party. Since these critters can pop up out of nowhere, I figured a more thorough search was in order. To my surprise the two dowitchers were joined by another two! My Victoria Checklist Area Red Knot, species number 288 on said list! I watched the bird for the better part of 45 minutes until I decided to head back to the Westshore. Always a treat to be able to enjoy a great bird! Esquimalt Lagoon was my other stop of the morning, as I'm still hoping for a stray Elegant Tern, a species that has invaded the Washington side of the strait.... It wasn't to be. There were no terns at all present among the Heermann's, California, Mew, and mutt gulls. No shorebirds either, except a distant calling Killdeer and a couple of Black Turnstones. 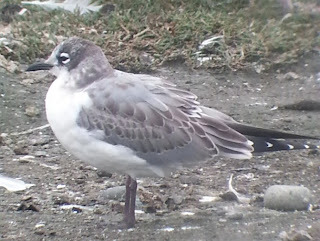 Midway down the Lagoon, at "the hump", a small gull slept, nestled in with a few others. The Franklin's Gull that had been checklist area bird #287 a few days earlier was still present, and sat still for a few shoddy phone-through-foggy-scope pics. As always, I aim to get bad pics of great birds, and these don't threaten that! All in all, a great day of birding. A great week in fact, when I can add two Victoria birds in a few days. The last time that happened was in 2011, and I can't imagine it will happen again anytime soon, if at all! Now that I have the last two missing birds that can be loosely considered "annual", I have no idea what is next!